Radiography ─ one of the most effective and widely used modern diagnostic techniques, allowing to quickly confirm or refute the presumptive diagnosis. With the help of x-rays is determined and differentialsa between a variety of different diseases. X-rays in otolaryngology is only a particular use of this powerful diagnostic method. This article will talk about the features of the method, indications, contraindications, peculiarities of their use in children. 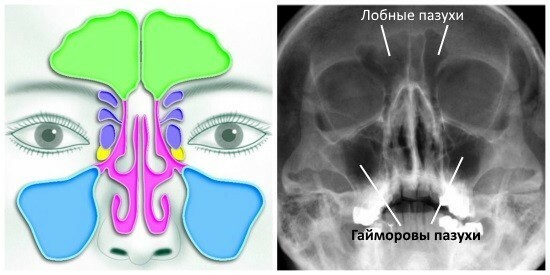 X-rays of the nose and paranasal sinuses is performed in two projections ─ axial and lateral. The sinuses are cavities in the bone skeleton skull, lined with mucous membrane. Release: 2 the maxillary sinus (maxillary, have the highest clinical significance), 2 frontal, 1 sphenoid, and ethmoid 2 of the maze. A narrow anastomosis between okolonosovykh sinuses and nasal cavity, resulting in easily broken cleansing the sinuses and inflammation begins. The growth of the pharyngeal tonsil (adenoids), except that in itself is a painful condition, also mechanically prevents the outflow of the sinuses and predisposes to the development of sinusitis. Nasal congestion, a violation of nasal breathing, especially in children, and the consequent change of voice. 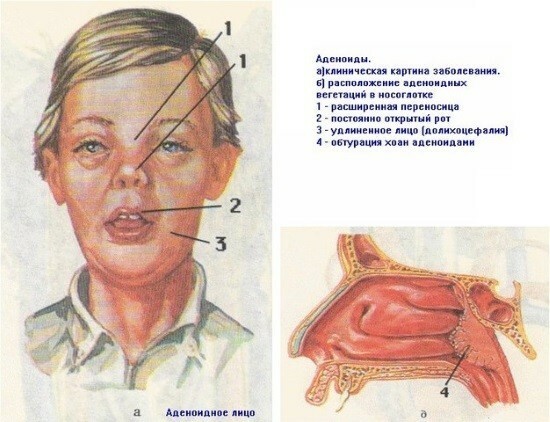 Impaired growth of the facial skull ─ the nose if breathing is difficult, breathing and constantly-open mouth is formed by the unique appearance of the child: the face is elongated, the upper jaw is lengthened, the upper teeth protrude forward, mouth half open. An x-ray of nose and paranasal sinuses in an urban clinic by place of residence, taking the direction to study at the otolaryngologist, as well as the charge in private clinics. Special training child to study is not required. Radiography is highly undesirable for children, especially early age. Use this technique only on the testimony and the impossibility of establishing the diagnosis using other methods. Radiation exposure from the use of modern equipment is about 0.03-0.05 mSv. To assess radiation: a man flying on Board the aircraft, receives a dose of about 0.01 mSv in 1 hour. You need to use the most modern x-ray equipment, modern techniques allow to reduce radiation exposure. 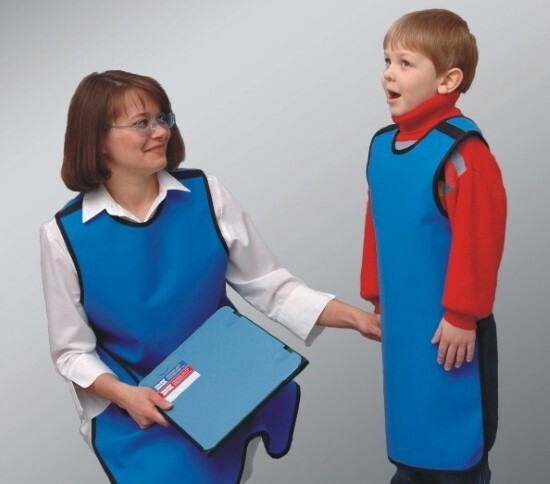 During the examination region of the patient’s body (child) that do not undergo imaging should be protected with PPE containing a material in its rentgenologii properties similar to lead. Use optimal modes of research, the regulations of which are contained in governing documents. Replace x-ray examination can modern techniques such as CT and MRI. They better visualize the study area and allow for more subtle differential diagnosis of. But if the use of MRI may have children of any age, the use of CT is limited by the presence of radiation exposure (from 2 to 10 mSv). In addition, both methods ─ are costly. Ultrasound examination can give information about the status of the paranasal sinuses. For kids this method is more favorable than x-rays, but it is not so accurate. Not always it is possible to obtain diagnostically relevant information, but in the hands of an experienced specialist ultrasound machine may help in identifying many diseases of the ENT organs. Pathology of ENT-organs can be diagnosed with endoscopy of the nasopharynx. 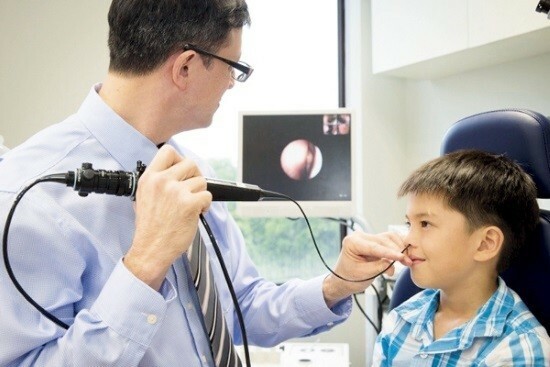 This method is very accurate, so that the doctor can own eyes to assess the condition of the nasal cavity and nasopharynx of the child.